A Taq Bostan carving depicts women playing changs (Persian harps) while the king is hunting. Taq-e Bostan (Persian: طاق بستان‎, Southern Kurdish: تاقوەسان) means "Arch of the Garden" or "Arch made by stone" is a site with a series of large rock reliefs from the era of Sassanid Empire of Persia (Iran), carved around the 4th century AD. Taq-e Bostan and its rock relief are one of the 30 surviving Sassanid relics of the Zagros mountains. 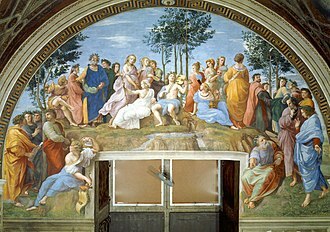 According to Arthur Pope, the founder of Iranian art and archeology Institute in the US, "art was characteristic of the Iranian people and the gift which they endowed the world with." The Taq-e Bostan complex comprise a rock relief standing on its own and several more reliefs associated with two rock cut arches. They illustrate the investiture ceremonies of the kings Ardashir II, Shapur II, Shapur III and Khosrau II. 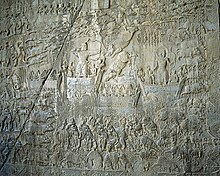 They also depict the hunting scenes of Khosrau II. The first Taq-e Bostan relief, and apparently the oldest, is a rock relief of the crowning ceremony of Ardashir II (379-383 AD) by his predecessor Shapur II or Ahura Mazda (although even the middle figure is wearing a Sassanian crown, with the balloon-like top/compartment [apparently to hold their hair in], and the figure to his left is the receiver of the ring; so he could not be Ahura Mazda, either). Researchers long debated the identities of the figures in this relief but is now ascertained that Ardashir II receives the beribboned ring - symbol of royal investiture - from his predecessor Shapur II or Ahura Mazda. There may be a deliberate mixture of the iconography of both identities. The two main figures are standing on the fallen Roman emperor Julianus Apostata (361-363 AD). Ardashir played an important role in his defeat during the reign of Shapur II (309-379 AD). Exceptional within Sasanian art is the fact that this is a portrait, based on the image of Julianus Apostata as it appears on Roman coins. Ardashir II was installed as interim ruler, awaiting the coming of age of the royal heir Shapur III (383-388 AD). The fourth figure is the god Mithra who holds a barsum in his hands and stands on a lotus flower. He is the protector of oaths and is witness to this pact. 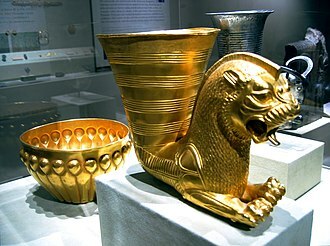 Local beliefs and Persian folk tale interpreted the scene as the victory of the first Sasanian kings on Artabanus IV, the last king of the Parthian dynasty. The Mithra figure became the visual inspiration for representations of the prophet Zoroaster. The relief panel is approx. 4.07 m wide and 3.9 m high. This is the figure of Mazda-worshipping Lord Shapur, the king of kings of Iran and Aniran, whose race is from the Gods. Son of Mazda-worshipping Lord Hormizd, the king of kings of Iran and Aniran, whose race is from the Gods, grandson of Lord Nersi, the Shahanshah (king of kings). This is the figure of Mazda-worshipping Lord Shapur, the king of kings of Iran and Aniran, whose race is from the Gods. Son of Mazda-worshipping Lord Shapur, the king of kings of Iran and Aniran, whose race is from the Gods, grandson of Lord Hormizd, the king of kings. The figures of the two kings have been carved in low relief, looking at each other. Each figure is ca. 2.97 meters. Shapur II is on the right and Shapur III is on the left. Their hands are placed on a long straight sword which point downwards. The right hand is holding the grip and the left rests on the sheath. Both figures wear loose trousers, necklaces, curled hair, and a pointed beard ending in a ring. The three figures on the back wall of the large iwan are usually considered to represent Khosrow Parviz flanked by Ahura Mazda and Anahita. They are placed above a mounted Persian knight, thought to be Khusrow himself riding his favourite horse, Shabdiz. There is, however, no unanimity about the exact identification of this late Sasanian king. The two attending figures are sometimes considered to be a priest and a priestess, rather than the gods Ahura Mazda and Anahita themselves. One of the most impressive reliefs inside the largest grotto or ivan is the gigantic equestrian figure of the Sassanid king Khosrau II (591-628 CE) mounted on his favorite charger, Shabdiz. Both horse and rider are arrayed in full battle armor. The front of the rock-cut arch bears delicately carved patterns showing the tree of life or the sacred tree. Above the arch and located on two opposite sides are figures of two winged women with diadems. On the right and left wall of the arch, there is a picture of the king's hunting measuring 3.8 X 5.7 meters. From the time of Cyrus the Great to the end of Sassanid period, hunting was one of the most favourite activities of Iranian kings. Therefore, scenes of hunting are frequently found next to those of crownings. There are two hunting scenes on each side of the ivan. One scene depicts the imperial boar hunt, and in a similar spirit, the other scene shows the king stalking deer. Five elephants flush out the fleeing boars from a marshy lake for the king who stands poised with bow and arrow in hand while being serenaded by female musicians. In the next scene, another boat carries female harpists and shows that the king has killed two large boars. The next boat shows the king standing with a semicircular halo around his head and a loose bow in his hand, meaning the hunt is over. Under this picture, elephants are retrieving the game with their trunks and putting them on their backs. Several episodes of the royal hunt are thus shown at the same time. These royal hunting scenes are among the most vivid and highly narrative murals immortalized in stone. Jumping 1300 years in time the upper relief shows the 19th century Qajar Governor in Kermanshah city, Dowlatshah carving a relief in a big arch. Detail from a Sassanid relief on the incoronation of Ardashir showing a defeated Julian. relief of Fath Ali Shah, the Qajar king, added to the ancient complex in the 19th century. Wikimedia Commons has media related to Taq-e Bostan. Ernst Herzfeld Papers, Series 5: Drawings and Maps, Records of Taq-e Bostan Site Collections Search Center, S.I.R.I.S., Smithsonian Institution, Washington, D.C.
Shapur III, was the twelfth king of the Sasanian Empire from 383 to 388. He was the son of Shapur II and had succeeded his uncle Ardashir II, shapurs cousin Zruanduxt married the King Khosrov IV of Armenia. Shapur III, knowing about the murder of many Sasanian kings by the nobles, declared to them in his accession speech, however, in the opinion of the nobility, this was unacceptable. Negotiations between the Romans and the Sasanians which had begun in the reign of Ardashir II culminated in a treaty of friendship in the year 384. The Persian diplomat who was part of this negotiation was a certain Yazdan-Friy-Shabuhr, according to this treaty, Armenia was partitioned between the Romans and the Persians. Therefore, two kingdoms were formed, one a vassal of Rome and the other, of Persia. The larger portion, which consisted of the regions lying towards the east, passed under the suzerainty of Persia, and was handed over to an Arshakuni, named Khosrov IV, thus friendly relations were established between Rome and Persia which survived for thirty-six years. Shapur III died in 388, after reigning a little more than five years and he was a man of simple tastes, and was fond of spending his time outdoors in his tents. 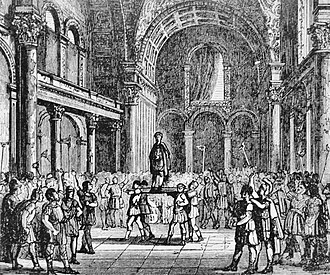 He died when some nobles cut the ropes of a tent that he had erected in one of his palace courts. He was shortly succeeded by his son Bahram IV, Shapur III left behind him a sculptured memorial, which is still to be seen in the vicinity of Kermanshah. 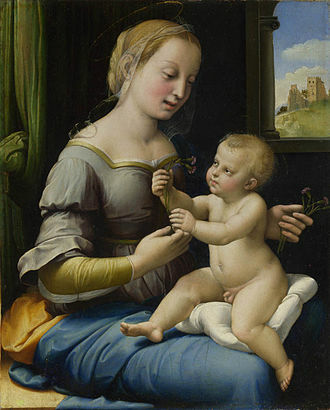 It consists of two similar figures, looking towards each other, and standing in an arched frame. 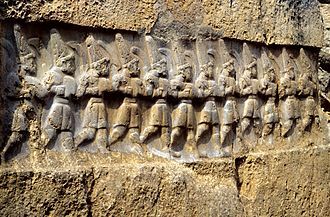 On either side of the figures are inscriptions in the Old Pahlavi character, whereby we are enabled to identify the individuals represented with the second and the third Shapur. They are identical in form, with the exception that the names in the inscription are Shapur, Narseh, while those in the left-hand one are Shapur, Shapur. Inscription of Shapour II and Shapour III in Taq-e Bostan Pourshariati and Fall of the Sasanian Empire, The Sasanian-Parthian Confederacy and the Arab Conquest of Iran. An equestrian statue is a statue of a rider mounted on a horse, from the Latin eques, meaning knight, deriving from equus, meaning horse. A statue of a horse is strictly an equine statue. A full-sized equestrian statue is a difficult and expensive object for any culture to produce, Equestrian statuary in the West goes back at least as far as Archaic Greece. Found on the Athenian acropolis, the sixth century BC statue known as the Rampin Rider depicts a kouros mounted on horseback, a number of ancient Egyptian and Persian reliefs show mounted figures, usually rulers, though no free standing statues are known. The Chinese Terracotta Army has no mounted riders, though cavalrymen stand beside their mounts, the Regisole was a bronze classical or Late Antique equestrian monument of a ruler, highly influential during the Italian Renaissance but destroyed in 1796 in the wake of the French Revolution. 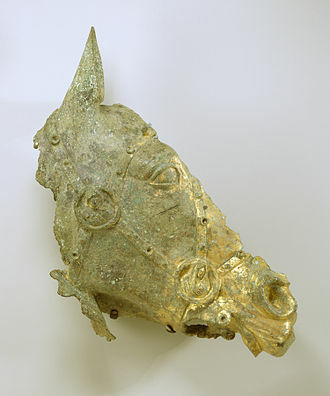 It was originally erected at Ravenna, but removed to Pavia in the Middle Ages, a fragment of an equestrian portrait sculpture of Augustus has survived. Equestrian statues were not very frequent in the Middle ages, there are some examples, like the Bamberg Horseman, located in Bamberg Cathedral. Another example is the Magdeburg Reiter, in the city of Magdeburg, there are a few roughly half-size statues of Saint George and the Dragon, including the famous ones in Prague and Stockholm. The Scaliger Tombs in Verona include Gothic statues at less than lifesize, a well-known small bronze in Paris may be a contemporary portrait of Charlemagne, although its date and subject are uncertain. Leonardo da Vinci had planned an equestrian monument to the Milanese ruler. The The Wax Horse and Rider is a model for an equestrian statue of Charles dAmboise. Titians equestrian portrait of Charles V, Holy Roman Emperor of 1548 applied the form again to a ruler, taccas studio would produce such models for the rulers in France and Spain. 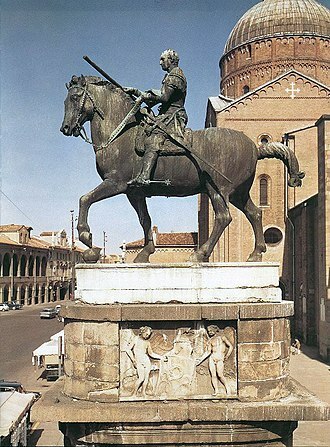 His last public commission was the equestrian bronze of Philip IV, begun in 1634. The near life-size equestrian statue of Charles I of England by Hubert Le Sueur of 1633 at Charing Cross in London is the earliest large English example, which was followed by many. The Zagros Mountains form the largest mountain range in Iran and southeastern Turkey. This mountain range has a length of 1,500 km. The highest point in the Zagros Mountains is Dena, the Zagros fold and thrust belt was formed by collision of two tectonic plates, the Eurasian Plate and the Arabian Plate. This collision primarily happened during the Miocene and folded the rocks that had been deposited from the Carboniferous to the Miocene in the geosyncline in front of the Iranian Plate. The process of collision continues to the present and as the Arabian Plate is being pushed against the Eurasian Plate, the Zagros Mountains, a relatively dense GPS network which covered the Iranian Zagros proves a high rate of deformation within the Zagros. The GPS results show that the current rate of shortening in the southeast Zagros is ~10 mm/yr, the north-south Kazerun strike-slip fault divides the Zagros into two distinct zones of deformation. The GPS results show different shortening directions along the belt, normal shortening in the southeast, the sedimentary cover in the SE Zagros is deforming above a layer of rock salt whereas in the NW Zagros the salt layer is missing or is very thin. This different basal friction is partly responsible for the different topographies on either side of the Kazerun fault. Higher topography and narrower zone of deformation in the NW Zagros is observed whereas in the SE, deformation was spread more, stresses induced in the Earths crust by the collision caused extensive folding of the preexisting layered sedimentary rocks. Subsequent erosion removed softer rocks, such as mudstone and siltstone while leaving harder rocks, such as limestone and this differential erosion formed the linear ridges of the Zagros Mountains. The depositional environment and tectonic history of the rocks were conducive to the formation and trapping of petroleum, salt domes and salt glaciers are a common feature of the Zagros Mountains. Salt domes are an important target for exploration, as the impermeable salt frequently traps petroleum beneath other rock layers. The Zagros Mountains have a totally sedimentary origin and are primarily of limestone. In the Elevated Zagros or the Higher Zagros, the Paleozoic rocks could be found mainly in the upper and higher sections of the peaks of the Zagros Mountains along the Zagros main fault. Ardashir II, was the eleventh Sassanid King of Persia from 379 to 383. He was the brother of his predecessor, Shapur II, during the reign of Shapur II, Ardashir had served as governor-King of Adiabene, where he had reportedly persecuted Christians. 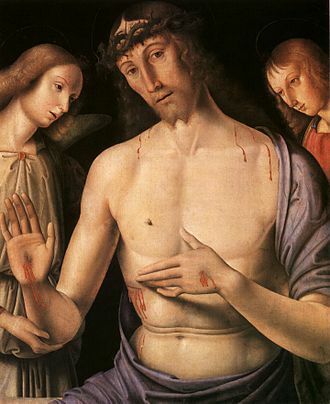 However, the acts of brutality against Christians attributed to him severely contradict the view that he was the most kind. Ardashir II was given the epithet Nihoukar or Beneficent by the Persians, the Arabs called him Al Djemil or the Virtuous. According to the Modjmel-al-Tewarikh, he took no taxes from his subjects during the four years of his reign, before becoming king of Persia, he was governor-King of Adiabene from 344 to 376. In 379 Shapur II, the brother of Ardashir appointed him as his successor. 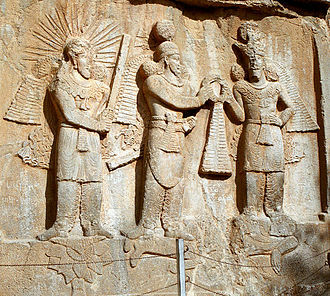 It is believed that Ardashir took part in the defense of the Sasanian Empire with Shapur II when it was invaded by Emperor Julian, when Ardashir became king he ordered a rock relief to be made at Taq-e Bostan showing him flanked by Mithra and Ahura Mazda. During his reign as Shah of Persia, events in Armenia seemed to occupy Ardashirs attention, the son of Arsaces II, Papas had been murdered during Shapurs reign and the Romans had replaced him with a certain Varasdates who was a member of the Arsacid family. However, real power was in the hands of Mushegh I Mamikonian, Mushegh was suspected of having conspired with the Emperor of Rome and was murdered by Varasdates. In return for their services, Manuel allowed the Persians to maintain a garrison in Armenia, but this arrangement did not work for long. A nobleman named Merujan wrongly informed Manuel that the commandant of the Persian garrison desired to capture him, Manuel fell upon the ten thousand Persian soldiers stationed in Armenia and murdered them. But Manuel died soon afterwards and confusion followed, desirous of maintaining peace in the borderlands, the Roman Emperor Theodosius I and Ardashir decided upon a treaty. But Ardashir died in 383 before the treaty could be signed, the treaty was eventually signed and ratified by his nephew Shapur III in the year 384. The chang is a Persian musical instrument similar to harp. It was very popular and used widely during the times of ancient Persia, the chang has appeared in paintings and wall art in Persia since its introduction in about 4000 B. C. In these paintings and mosaics, the chang went from the arched harp to an angular harp in the early 1900s B. C. with vertical or horizontal sound boxes. 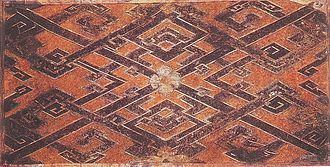 By the beginning of the Common Era, the chang had changed shape to be less of an instrument and more of a large, Hellenistic. 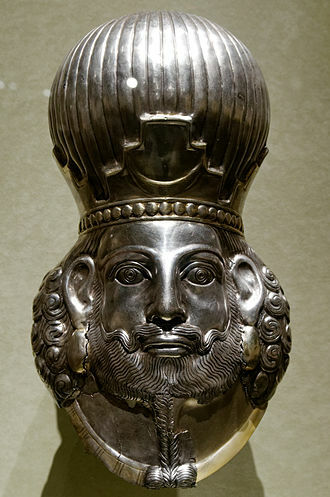 Sassanian courts were enamored with the more Hellenistic chang and increased its popularity, but by the end of the Sasanian period, the chang had been redesigned to be as light as possible. Becoming more elegant, the chang lost much of its rigidity and structural soundness, the chang that is used today resembles the last documented transformation. In medieval Azerbaijan, the chang had 18-24 strings but varies based on how far the chang dates back. In the design of some ancient changs, sheep skin or goat skin was used to amplify the sound making it closer to an eastern harp. In modern days the chang is made out of string or the tail of a horse. The past structure of the chang was typically goat or sheep skin, the skins used on the chang give it a different sound. The chang was predominantly played by women during ancient times, the chang is being revived and is now starting to make its way back into the field of contemporary Persian music. There are records from as far back as 4000 B. C. that depict pictures of the chang being played, along with other instruments and a singer. Since the playing style of the chang does not share any similarities with other Persian instruments, it is an instrument to pick up, play. As a result, the number of players is small. There are a few players of the chang including Mrs. Parvin Ruhi. Today the chang is played in ensembles, such as religious ceremonies and parties. In recent years, the Iranian scholars and instrument makers have been trying to revive the ancient chang back to its former glory, the chang is a name given to the fangxiang, a Chinese metallophone played in China since ancient times. 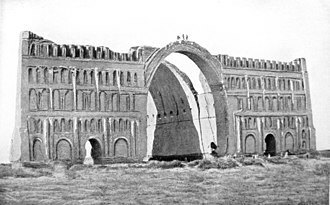 Tāq Kasrā and Ayvān-e Kasrā, meaning Iwan of Khosrow) are names given to the remains of a Sasanian Persian monument, which is sometimes called the Archway of Ctesiphon. It is located near the town of Salman Pak, Iraq. It is the only remaining structure of the ancient city of Ctesiphon. The archway is considered to be a landmark in the history of architecture, the exact time of construction is not known with certainty. Construction possibly began during the reign of Anushiruwan the Just after a campaign against the Byzantines in 540 AD. The arched iwan hall, open on the side, was about 37 meters high 26 meters across and 50 meters long. The arch was part of the palace complex. 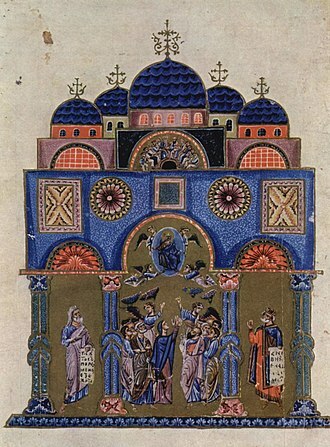 The throne room—presumably under or behind the more than 30 m high. The top of the arch is about 1 meter thick while the walls at the base are up to 7 meters thick and it is the largest vault ever constructed in the world. The catenary arch was built without centring, in order to make this possible a number of techniques were used. Bishapur was an ancient city in Iran on the ancient road between Persis and Elam. The road linked the Sassanid capitals Estakhr and Ctesiphon and it is located south of modern Faliyan in the Kazerun County of Pars Province, Iran. Bishapur was built near a crossing and at the same site there is a fort with rock-cut reservoirs. The name Bishapur derives from Bay-Šāpūr, which means Lord Shapur, in his native province of Fars, he built a new capital that would measure up to his ambitions, Shapurs City. Outside the city, Shapur decorated the sides of the Bishapur River gorge with huge historical reliefs commemorating his triple triumph over Rome. One of these reliefs, in a shape, has rows of registers with files of soldiers and horses. The city, as the dam bridge in Shushtar, was built by Roman soldiers who had been captured after Valerians defeat in 260. However, it was not a new settlement, archaeologists have found remains from the Parthian. The city remained important until the Arabian invasions and the rise of Islam in the quarter of the 7th century. 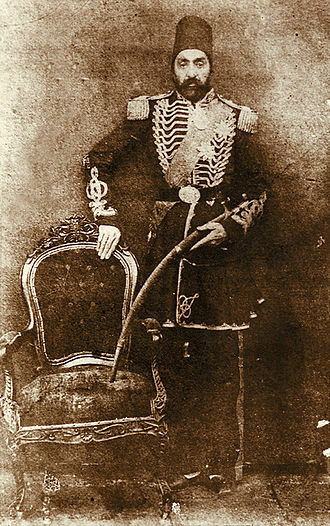 Mohammad Ali Mirza Dowlatshah was a famous Persian Prince of the Qajar Dynasty. He is the progenitor of the Dowlatshahi Family of Persia and he was born at Nava, in Mazandaran, a Caspian province in the north of Iran. He was the first son of Fath-Ali Shah, the second Qajar king of Persia, and Ziba Chehr Khanoum and he was the elder brother of Abbas Mirza. Dowlatshah was the governor of Fars at age 9, Qazvin and Gilan at age 11, Khuzestan and Lorestan at age 16, and Kermanshah at age 19. In the battles with Russia and Persias arch rival, the Ottoman Empire, he defeated the Ottomans in Baghdad and Basra, Dowlatshah developed and improved the city of Kermanshah and established the city of Dowlat-Abad which was renamed to Malayer. His descendants live in different countries in the world and carry the last names دولتشاهی, though older than his brother Abbas Mirza, Mohammad Ali Mirza Dowlatash was never heir to the Persian throne, because his mother was not of the royal dynasty. However, his father Fath-Ali Shah appointed Dowlatshah to rule and protect the boundaries of the two Iraqs and adjoined Khuzestan province to his territories, in fact, during Dowlatshahs time, Kermanshah had become a citadel against the Ottomans. 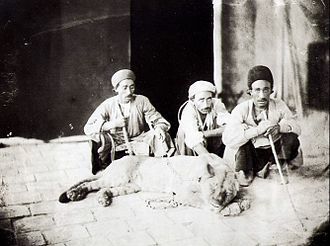 Dowlatshah carried the last, and initially successful, attack on the Ottoman Iraq in 1821. Persia was resentful of the inability of the Ottoman government to protect the Shia population of Iraq against the Saudi-Wahhabi attacks that had begun in 1801, many of the Shias killed in the raids were Iranians, some of whom closely related to the ruling Qajar dynasty of Persia. His forces quickly occupied Shahrazur and Kirkuk, and laid siege to Baghdad and his skills and ambitions mirrored those of his younger brother. 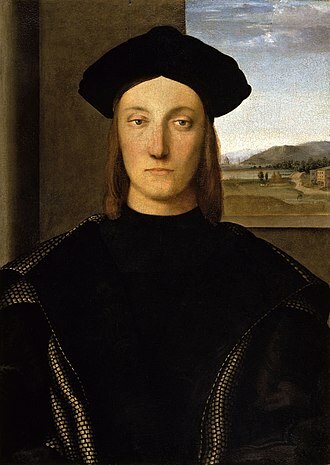 He was a military leader and a patron of the arts, poetry. The origin of the family names Dowlatshah and close variations such as Dolatshahi are from this ancestors title, in recent years this mosque has been repaired. It consists of separate areas along with a courtyard. The city of Kermanshah is located in the center of the province and has a temperate climate and it is one of the ancient cities of Iran and it is said that Tahmores Divband, a mythical ruler of the Pishdadian, had constructed it. Narseh was the seventh Sasanian king of Ērānshahr. He was the son of Shapur I, during the rule of his father Shapur I, Narseh had served as the governor of Sakastan and Turan. Prior to becoming King of Persia, he held the title Great King of Armenia, Narseh overthrew the increasingly unpopular Bahram III in 293 with the support of most of the nobility. The circumstances of Narsehs rise to power are detailed in the Paikuli inscription, Narseh was known for his tolerance of other religions. Narseh is quoted in an inscription by his father Shapur I as the governor of Sindh, Narseh was appointed as governor of Armenia. Following the death of Bahram II in 293 CE, his son Bahram III was proclaimed king in Pars by a group of nobles led by Wahnam and supported by Adurfarrobay, governor of Mesan. Four months into Bahram IIIs reign, Narseh was summoned to Ctesiphon by the request of members of the Persian nobility. According to the Paikuli inscription these nobles swore their allegiance to him there. In a brief revolt, Wahnam was captured and executed and Bahram was removed from the throne and it is assumed Bahram III was killed in the uprising though there is no documentation of this so his fate remains uncertain. During Narsehs time, Rome was ruled by Diocletian and it was with Diocletian, in 296, fed up with incursions made by the Armenian monarch Tiridates III, Narseh invaded Armenia. Surprised by the attack, Tiridates fled his kingdom. The Roman Emperor Diocletian dispatched his son-in-law Galerius with an army to Tiridatess aid. Galerius invaded Mesopotamia, which Narseh had occupied hoping to check his advance, three battles were fought subsequently, the first two of which were indecisive. In the third fought at Callinicum, Galerius suffered a defeat and was forced to retreat. Galerius crossed the Euphrates into Syria to join his father-in-law Diocletian at Antioch, on his arrival at Antioch, Galerius was rebuked by Diocletian who disgraced him for his shameful defeat at the hands of Narseh. Vowing to take revenge, Galerius made preparations throughout the winter of 297, supported by the Armenians, Galerius surprised Narseh in his camp at the Battle of Satala and inflicted a crushing defeat on the latter forcing him to flee in haste. Interior of the second room of Zagros Paleolithic Museum. Hellenistic-era depiction of Bahram as Hercules carved in 153 BC. Ardashir I receives the ring of power from Ahura Mazda. An early Alchon Huns coin based on a Sasanian design, with bust imitating Sasanian king Shapur II. Dated 400-440 CE. Darius I inscription (the DNa inscription) on the upper left corner of the facade of his tomb. The nationalities mentioned in the DNa inscription are also depicted on the upper registers of all the tombs at Naqsh-e Rustam. One of the best preserved is that of Xerxes I. The Palace of Ardashir, constructed in AD 224 during the Sassanid Dynasty. The building has three large domes, among the oldest examples of such large-scale domes in the World. Relief of Hormizd II as a prince. 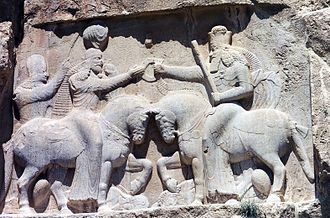 Relief of Hormizd II impaling his enemy at Naqsh-e Rostam. Naqsh-e Rustam investiture of Narseh (r. 293-302), in which the Sassanian king (second from right) receives the ring of kingship from Anahita (right).